Portable Handheld Scanner Radio Police Fire HAM Antenna Transceiver & Battery. Charger and Power Adapter. Frequency Ranges: 65-108 MHz (Commercial FM radio only). VHF: 136-174 MHz(Rx/Tx). UHF: 400-520 MHz(Rx/Tx). Broad (Wide) / Narrowband (Narrow). High / Low Power (5W/1W). Frequency Step: 2.5/5/6.25/10/12.5/25 kHz. 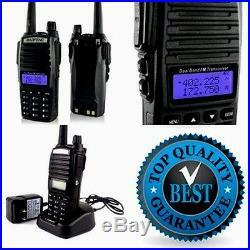 Functions include “VOX” (Voice Operated Transmission) and “OFFSET” (frequency offset for repeater access). Additional features include Function Menu Display on a bright LCD screen, and Function Busy Channel Lock (BCLO) which prevents channel interference caused by simultaneous transmissions. Specifications: General Frequency Range: 65-108MHz (FM Receive only), 136-174MHZ and 400-520MHZ (TX/RX) Programmable Channels: 128 Antenna: High gain Dual Band Antenna Operating Voltage: DC 7.4V Modes : Simple or Semi-duplex Antenna: SMA -Female Power adapter: Input: AC100-240V, 50-60Hz; Output: DC10V/500mA; Plug Type: US Maximum deviation: 5kHz(Wide) / 2.5kHz(Narrow) CTCSS/DCS deviation: 0.5 +/- 0.1kHz(Wide) / 0.3 +/- 0.1kHz(Narrow) Package includes: UV-82 Radio; 7.4V/1800mAh BL-8 Battery; Antenna; Battery Charger and Power Adapter; Belt Clip; Hand Strap; User Manual. After the product arrives. G wrong item or size, you will not be responsible for the return cost. Return Policies & Conditions. A General Return Information. The location of the warehouse responsible for the return will be determined by the fulfillment service department. Please be informed that our products are being stored and fulfilled by third party warehouses and manufacturers throughout the United States (also known as third party fulfillment or product sourcing). Therefore, the most appropriate return location will be determined by the respective warehouses or manufacturers, depending on your location and product types. Please refer to the return instructions and follow them accordingly to ensure successful return processes. We have warehouses and certified suppliers from all over the world. G during festivals, shopping seasons or excessively high volume order times. This is to ensure the greatest satisfaction of our dear customers and for us to better fulfill your ultimate shopping experience. S to order our items. All electronic appliances are designed for US voltage. Please be sure to use a converter. After the item has left the facility, the international tracking code will be provided. All electronic appliances are designed for US voltage. Please be sure to use a converter for your safety and to avoid damaging the item. Wekindlyrequest our valuedcustomers to send usa positive feedbackand asweare alwaysdependingonreviewsfrom youandalwaysneed yourassistance. We request you, please do not leave a negative or neutral feedbackbeforecontacting us, We will try our best to resolve any problemfor you!! Have a nice day to you. 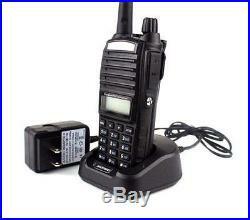 The item “Portable Handheld Scanner Radio Police Fire HAM Antenna Transceiver & Battery TM” is in sale since Thursday, May 7, 2015. 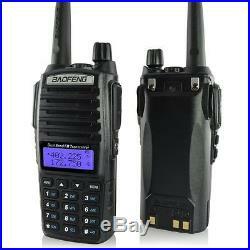 This item is in the category “Consumer Electronics\Radio Communication\Scanners”. The seller is “tmarketshop” and is located in United States. This item can be shipped to United States.